A cleit is a stone storage hut or bothy, uniquely found on the isles and stacs of St Kilda; whilst many are still to be found, they are slowly falling into disrepair. There are known to be 1,260 cleitean on Hirta and a further 170 on the other group islands. 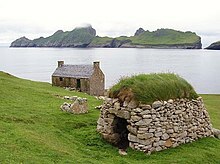 The outlying island of Boreray has the Cleitean MacPhàidein, a "cleit village" of three small bothies, which were used on a regular basis during fowling expeditions from Hirta. As a result of a smallpox outbreak on Hirta in 1727, three men and eight boys were marooned on Stac an Armin, near to Boreray until the following May. Typically the cleitean are found on hilly ground and therefore are typically laid out along the direction of the slope, with their front ends looking uphill and their rounded rear ends looking downhill. On St Kilda, the drystone walls are distinctive for their lack of coursing and seemingly random stone placement - this was deliberate, to ensure that the wind could pass through and thus help to preserve food stores kept there . Occasionally the entrance is found in a side wall. Examples also exist of cleitean built perpendicularly to the direction of the slope, with the entrance in one of the narrower ends. In order to be able to withstand any downward thrust, the end facing downhill is normally built in the shape of an apse with a strong support. Entrances are very rarely placed in the apsidal end, in order not to compromise its strength. Whilst she was kidnapped by her husband James Erskine, Lord Grange in the 1730s, Rachel Chiesley, Lady Grange was forced for some time to live in a cleit at Hirta, on St Kilda. The cleit in the Village meadows is said to resemble "a giant Christmas pudding". Some authorities believe that it was rebuilt on the site of a larger blackhouse where she also lived during her incarceration. In 1838 the grandson of a St Kildan who had assisted her quoted the dimensions as being "20 feet by 10 feet" (7 metres by 3 metres), which is a common size for a cleit. ^ Quine, David (1995). St Kilda. Colin Baxter Island Guides. ^ "St Kilda, Hirta, Village Bay, Cleit 85". Canmore. Retrieved 8 May 2010.